Whether you’re working hard or getting away from it all, the 2017 Suzuki KingQuad 400ASi helps you every step of the way. 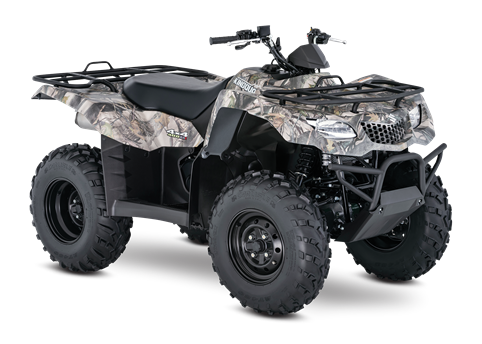 The fully automatic Quadmatic transmission has two and four-wheel drive modes to handle rough trail conditions while completing even the most demanding chores. Along with exceptional engine performance across the powerband, its high-performance iridium spark plug and Pulsed-secondary AIR-injection (PAIR) system helps provide outstanding fuel efficiency, and clean emissions. For the true outdoor enthusiasts, the 400ASi is offered in True Timber camouflage to help you blend in when you don’t want to be seen.